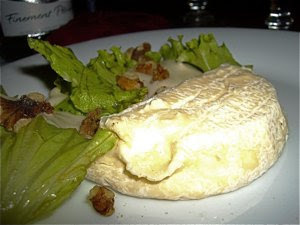 Lyon is the culinary capital in France, and is particularly known for its bouchons or steakhouses. I dined in three traditional restaurants and le Laurencin offered a good meal at a reasonable price on the second evening of my stay in Lyon. 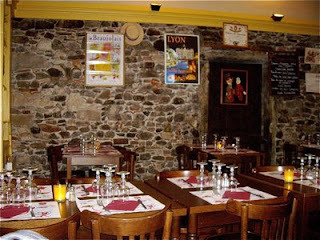 Le Laurencin is located in Rue St. Jean in old Lyon, in a house from 1568. An area steeped in history is prime location for a good restaurant. 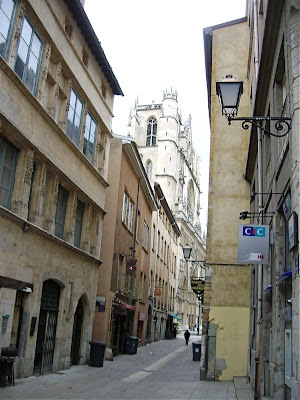 The nearest Metro station is Old Lyon, 500 metres further south, by the cathedral. See location on map here. It is extraordinary to dine in a 450 year old house, but I say that far more could have been done to create a more historic atmosphere. Beautiful walls in solid stone, were given a strong contrast by strongly painted yellow wooden details. Hardly a perfect combination. Patinated dark wood would have created a more historic interior. The tables and chairs were simple, in light wood. The tables were set with wine glasses, forks and knives, and napkins - plain and simple. There were not much room to sit in there as there were too many tables in the room, and if the restaurant had been fully booked, I would have had far too little space to sit. A three course dinner priced around the €20 mark is inexpensive, and the food was very good. Good service. I did not have to wait long to be served. The wine was served with a highly unusual amuse bouche, and the three other dishes followed without delay. I love to get a small appetizer, and at Le Laurencin I was served a very special pre-meal snack. This was certainly not anything for those of you with a high cholesterol. 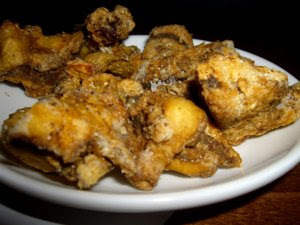 This was cold, fried pork crackling, and it was not only crispy, but a thick layer of fat lined the skin. It was seasoned with salt and pepper. It tasted well, but if you dive into food this rich before a meal, it may seriously affect your appetite, so I just had a modest nibble. It was good! Escargot with delicious herb butter is a safe choice as a starter. 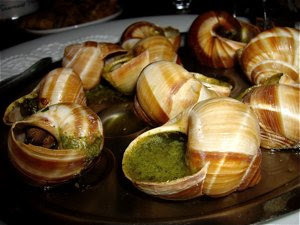 I know many of you have reservations, and a few could never consider eating snails, but when well prepared they are a delicacy. A taste of mushrooms and mussels. Yum!! 6 snails arrived on a traditional escargot plate and a funny spoon to hold the hot shells in your hand as you try to get the snail out. The herb butter had too little herb and garlic for my taste but they had a good texture and taste. Sorrel is certainly not anything for people with kidney problems, as this leaf vegetable has a high content of oxalic acid. 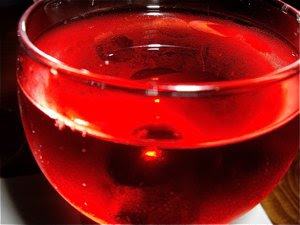 I hesitated before ordering, as I have had kidney stones twice, but I gave in as sorrel has a great citrus taste that would match red and white fish. This was the best part of the meal. 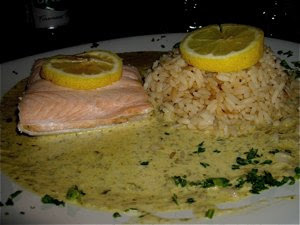 Salmon well seasoned and cooked to perfection, a rich, creamy sauce with delicious lemon/lime aromas and well cooked rice. This was a delicious choice, and the best I had during my stay in Lyon. I would return here just to eat this again, if coming to Lyon at a later date. I did not order any dessert when dining in Lyon. A well matured unpasteurized cheese is so much better. The waitress offered to local cheeses and I chose the soft Saint-Marcellin cheese with a very creamy, nearly runny consistency. Served with a crisp salad with walnuts and a good vinaigrette. I ordered the rosé wine à la maison, well suited for chicken, veal and fish. This was an excellent choice!! This was a seriously good meal, at a very reasonable price. Enjoy Food & Travel highly recommends the salmon with creamy sorrel sauce. Unforgettable. Zum Stadtkrug, Schwerin - honest German grub!